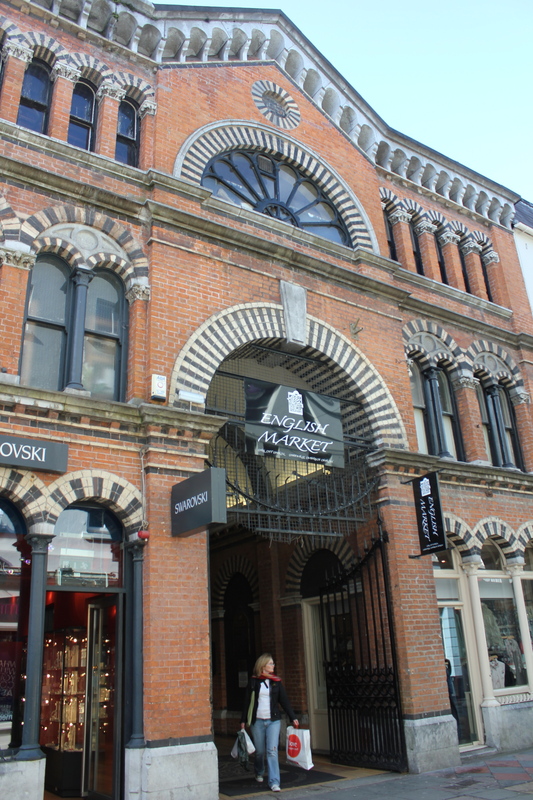 Cork's English Market is a foodie's paradise. After days of getting lost on the narrow, winding roads of the wild Beara Peninsula, I am now . . . getting lost on the narrow, winding roads of the wild Cork City. Driving here is a nightmare. The city center (or centre) is scrunched on an island in the river, and the “grid” was set up when ox carts brought their wares to market. That worked fine until cars were invented. It’s been hell ever since. The only change was to make many of the streets one way, apparently randomly. And they made some streets pedestrian only. Oh, and there are few road signs and no addresses. Some of the street are named, but like much of Europe the names are high up on the sides of buildings located approximately near the intersection. They are never on signposts where a driver could find them easily. When travelling from Waterford or Rosslare (N25), follow the Cork city centre signs taking the 1st exit at the Lota roundabout. Continue straight ahead along the Lower Glanmire Road following the city centre signs. Turn left at Water Street (you can’t go straight ahead) and continue driving along Horgans Quay, (river is on your left). Continue straight ahead passing 4 bridges on your left (river is always on your left). Once you have passed the 4th bridge on your left take the immediate right up Musgrave Road pass the Dominican Centre (yellow and pink building) on your left. The Maldron Hotel Cork is halfway up this steep hill/road take the 2nd left. If I can find it today I’m checking this place out for the tours. One of the main reasons for this trip is to personally inspect the lodgings. Last night I was glad I did. We won’t be staying at the Rose Lodge, a guesthouse next to the University of Cork campus, which looks lovely on their website. In person, not so much. I think it used to be a convent. They probably painted over the crucifix outline over the bed. The lobby is nice but the room, where I am staying for two nights, is tiny and spartan. The view looks out over the roofs behind the building and the orange rug has mysterious stains. But at least it’s warm, unlike the palatial Glengarriff Park Hotel room I stayed in last, where they skimped on the heater size and the room never got above cool. Anyway, after I ditched the rental car in a parking garage yesterday I walked around the compact city center, and was much better able to enjoy it. 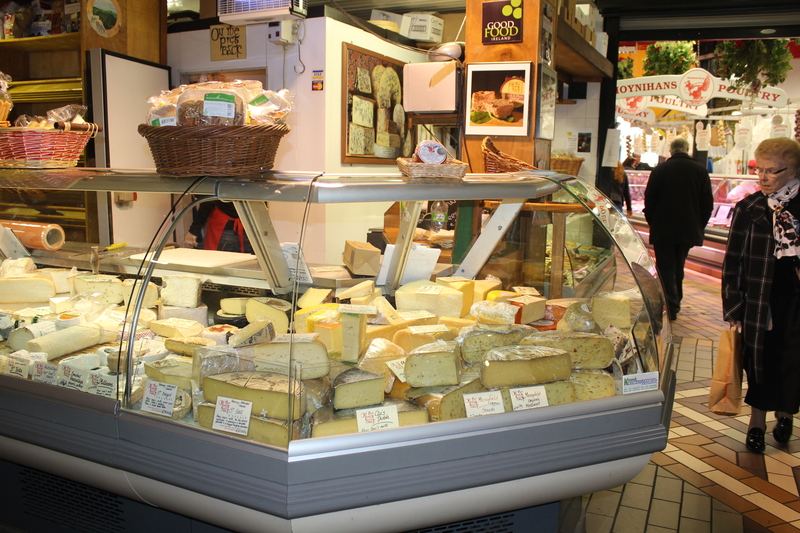 A highlight is the English Market, a huge complex which is the gastronomic hub of the city. Row upon row of beautiful Irish cheeses, aromatic freshly baked bread, pungent, freshly caught fish, and every other item you would need to prepare an Irish feast, all under one skylighted roof. Say cheese! Lots and lots of cheese. It’s a little like Seattle’s Pike Place Market, but without the million flower vendors. 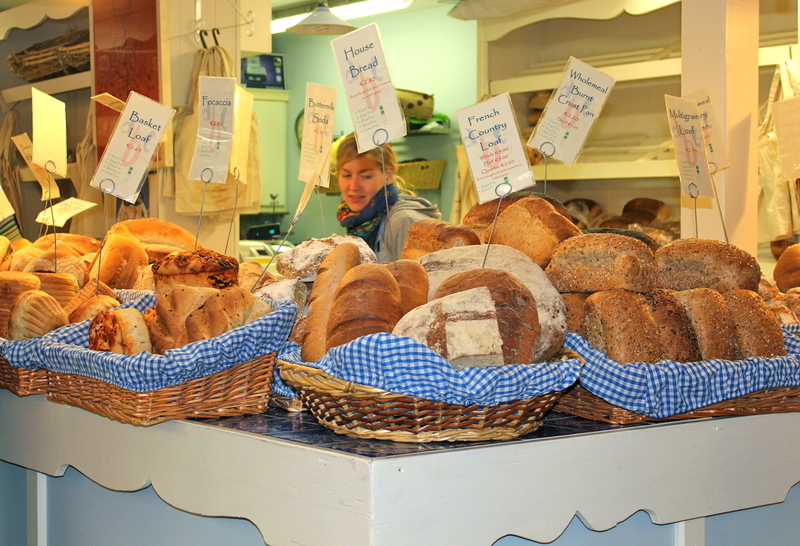 The English Market is a place real people buy real food. The city holds an entirely new set of photo opportunities, from interesting architecture old and new to curious signs and colorful people. The sun is shining today, time to explore. After I park the car. 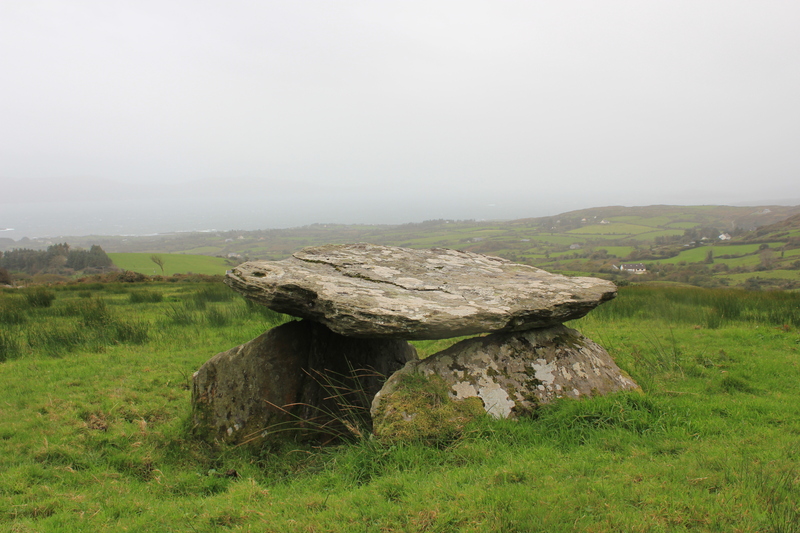 Ballynahowen wedge tomb, near the village of Adrigole. It was time to push on today, my two weeks here ticking by far too quickly. A stiff wind blew and rain threatened as I drove north up the east side of the Beara Peninsula. I feel my time here, even if far too short, was well spent. I got to know the area much better, although it’s a case of the more you know, the more you know how much you don’t know. You know? There really is so much to discover here. So much in fact that I’m already thinking of adding one more day to the tour! Partly that’s because we will really need two nights in Portmagee, before and after visiting Skellig Michael, but also to spend one more day on the Beara. I want people to be able to slow down and feel the pace of life here; to walk the ancient paths and watch the sun set over the Atlantic off the wild rocky coast; contemplate the stone monuments left by the people who so long ago called this remote place home, and share a pint with some of the locals. 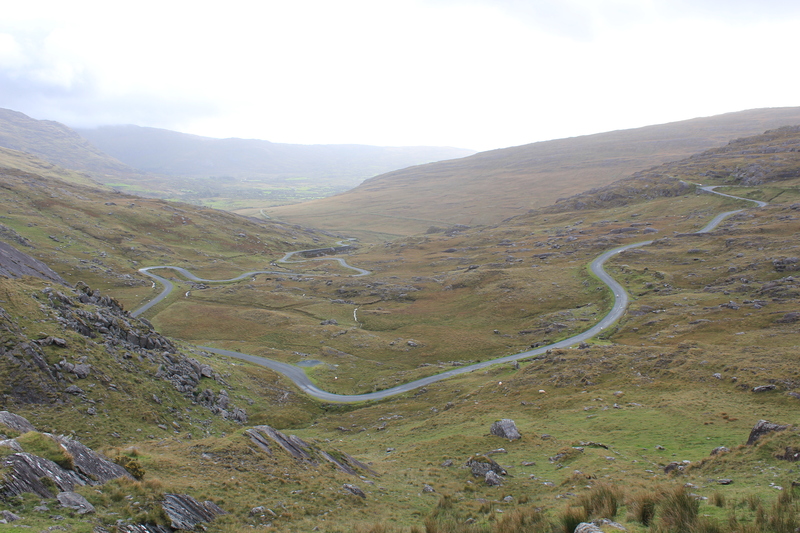 Healy Pass, built as a Famine project, connects the two sides of the Beara Peninsula. I’m sure that, like me, the Beara will seep into their soul. Now I’m not romantic enough to think the Beara is the only wonderful place in Ireland — there are many, many more. But it is certainly one of the most wonderful, and one I am looking forward to sharing with others. Tomorrow I shift gears and head to Cork, the second largest city in Ireland. We’ll see how much of a culture shock it is. For those who want to see the Beara Peninsula on film, there have been two recent movies set here, both starring Colin Farrell. One is a BBC two-part made for TV movie called “Falling for a Dancer” (which I mentioned before), the other is “Ondine.” Both are available from Netflix.